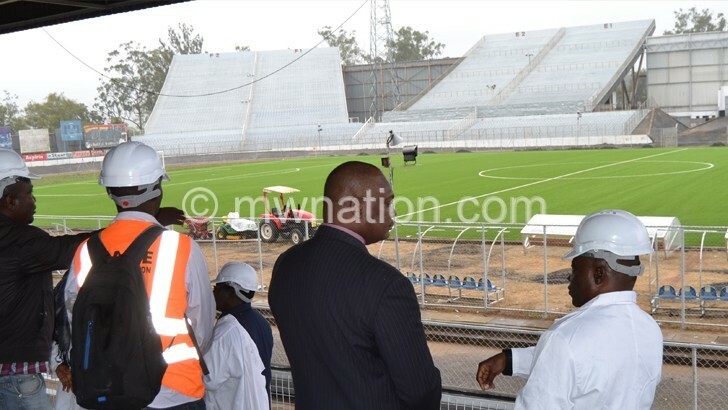 The Football Association of Malawi (FAM) has given Kamuzu Stadium in Blantyre the seal of approval to start hosting local matches. This follows an inspection that was carried out by the association on Wednesday. On his part, the minister said they were satisfied with the works that have been carried out. “Rehabilitating a structure that is very old is not that easy, but the contractors have tried their best. The onus is now on the users to take good care of it. “Government spends a lot of money on renovations due to vandalism and if, for example, teams are found to be responsible for vandalism, we will charge them and they will not be allowed to play until they pay. As for supporters, we will find a way to hunt them down so that they too are penalised,” he said. The renovations included toilets, VIP and covered stands, dressing rooms, perimeter fence and erection of a tunnel from the dressing room to the pitch and installation of a new artificial turf.. The renovations have cost about K293 million.